Cherry Earrings because they're just that cute. Get your Rockabilly going with these bright red jewels on your ears. Whimsical earrings created with Czech glass druk beads and Czech pressed glass leaf beads. The earrings measure 1.75" in length. 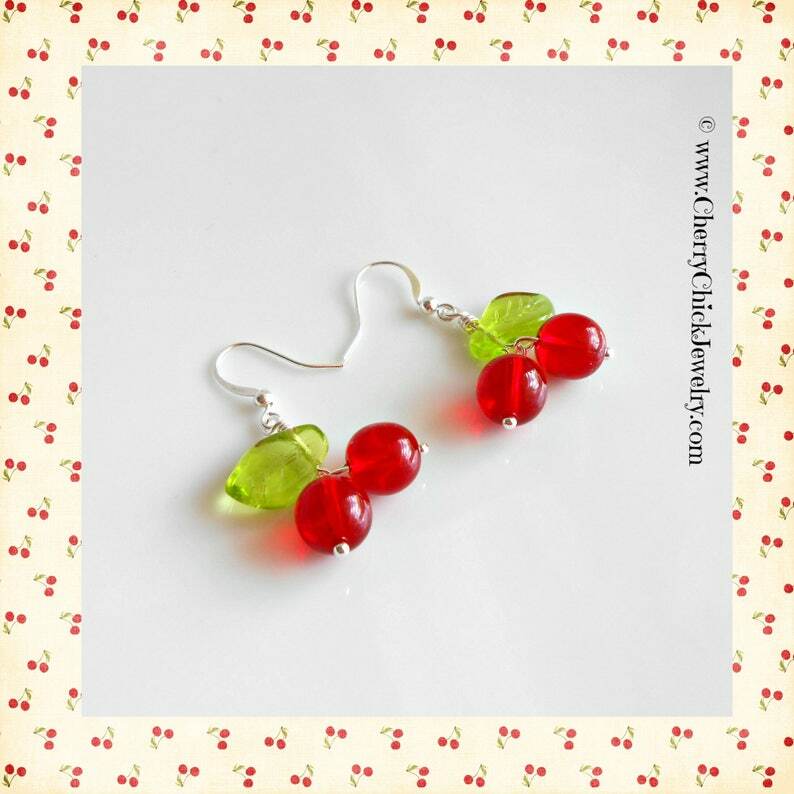 This listing is for one pair of Cherry earrings. Some photos may contain other pieces of my jewelry that have been included to show how they coordinate together. They can be found in separate listings to purchase. Love these! they are sooo cute! These are so pretty and cute!!! I currently accept payment via PayPal where you may use your credit card without having a PayPal account or you can use a debit card, credit card, or Etsy gift card by using Etsy Direct Checkout. With over 280 sales I have not had a package lost by the Postal Service. There have been a few that have been delayed that I have spent hours tracking down to get them to my customers. If you find that your package has not arrived within a weeks time please let me know so that I can began the process to file for a "missing package" inquiry. All of my products are made in a Smoke Free Home. At this time I'm not able to do Custom Orders but if there is something that you would like to see please let me know and I will contact you in the future should I be able to create it.